Free download best new 2018 Halloween party songs playlist for playing on PC, Mac, iPhone (XS/XS Max/XR), iPad, etc. Question: "Hey, 2018 Halloween coming soon and I'm thinking about creating a level on the theme. I began to regroup stuff to use in my future level but I find absolutely no songs. Someone know where I can free download Halloween party songs?" I have tons of music for 2018 Halloween party, but since I usually have a small party (not really in a specific theme) and some TOTers coming & going, I usually just set up several Halloween party playlists or comps that I downloaded, including scary Halloween party songs and soundtracks, Halloween party music for kids etc., and let those stream. So I don't have to think about it much. Hallmark: Sounds of Halloween is a good one! The 13th Hour would be great too. This year, I want to include more Halloween songs to my playlist, including Michael Jackson "Thriller", Kanye West "Monster", "I Put a Spell On You", Donovan "Season of the Witch", "Ghost Town" and the like. Also, I need to download some Halloween party songs for kids. Free download Halloween party playlists to iPhone iPad MP3. Free download Halloween party music videos from 600+ sites. 3. Ghostbusters Ray Parker Jr.
* An all-in-one online video download and convert tool, helps get off your loved Halloween party movie videos or songs online from YouTube, Dailymotion, Soundcloud, Facebook, Vimeo, etc. * Ultra-fast download speed (5-8X real-time speed), thanks to its hardware acceleration technology. * Allows you to convert Halloween party songs to MP3, AAC, WMV, MOV, iPhone (XS/XS Max/XR), iPad, Android mobile, etc all at once. * Fully compatible with Windows 10 and also available in Mac version. How to Download YouTube Halloween Party Playlist to MP3? As we mentioned previously, to download and convert YouTube music for Halloween party to MP3 iPhone iPad or other gadgets, download WinX HD Video Converter Deluxe first and follow our next Halloween party playlist downloading steps here. Step 1: Go to YouTube, do a search of "Halooween Party Songs", and find the best one you like. Step 2: Launch your installed YouTube downloader, copy and paste the Halloween party playlsit video URL, and click to Analyze it. The URL can be detected automatically. Step 3: Select one of those video formats/resolutions shown in the box. And never forget to tick the button "Auto convert" if you want to convert the Halloween party music video to MP3, iPhone, iPad, etc. Step 4: Output Profile ->- Choose "to Music" ->- Select "MP3" as the output format. Step 5: Hit button "RUN" and all your loved Halloween party songs on YouTube will be downloaded at an ultra-fast speed. 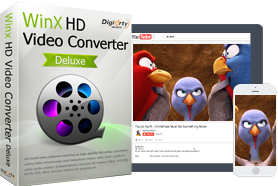 If you need to download and convert kids rhymes songs from YouTube to iPhone, iPad, Samsung Galaxy, etc, please turn to WinX HD Video Converter Deluxe.